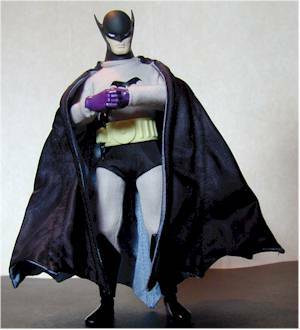 The latest addition to the DC Superheroes 9" line is this version of Batman, from 1939. This Golden Age representation is Batman at the very beginning, back to his roots in comics. The figure was designed with the help of Alex Ross, well known comic artist, and it shows. 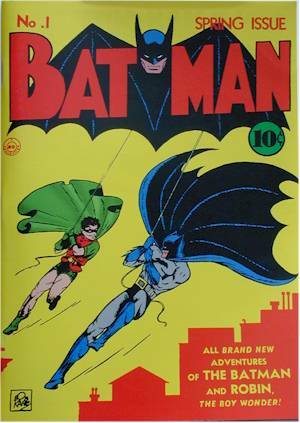 The figure is packed with a reprint of Batman #1, and a book on the Golden Age of Batman by Les Daniels. But the real treat here is the figure - it is easily the best produced in this series so far. It's the same 9" body you've seen before. You'll either hate it or love it - there doesn't seem to be much in between. I'm not sure who did the actual sculpt, but they did a wonderful job. 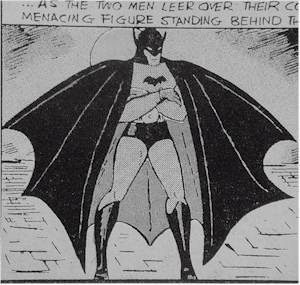 No oversized head here, and they captured this early caped crusader perfectly. Even the tendency for these figures to look down slightly works to this figure's advantage. The comic book and hardcover book are nice, but not really a great addition to the value. The comic is an interesting reprint, but isn't really indicative of the figure. Something from Detective Comics would have been more appropriate. And while the Les Daniels book is very nice, with some beautiful illustrations and great information, it's just the first two chapters from his much larger and more detailed book on Batman. If you have his previous book, this one is pretty much a waste. I did notice a few new pictures, but that's really not worth buying this over. 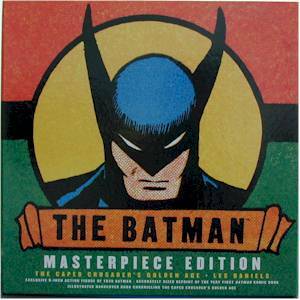 It's a much better value if you don't already have his earlier work - but most serious Batman fans already picked it up. A very nice job on the box. The graphics are bright and attractive, and it has that 'pulp' feel to it. It's a nice heavy construction, and looks like it can withstand some shelf wear. Everything comes out easily enough, but something a little more solid to hold the figure inside the box would have been a good idea. Superb work on this costume. The hands are painted purple, which matches the very early pictures below. The oversized belt works terrific, and the cape is fantastic. It even has three thick wires in the material, that can be used to pose the cape. The material for the black shorts is a nylon, while the rest of the costume is a soft material that gives you the impression of 'the good old days', rather than spandex. Everything is hemmed, unlike previous DC 9" figures. 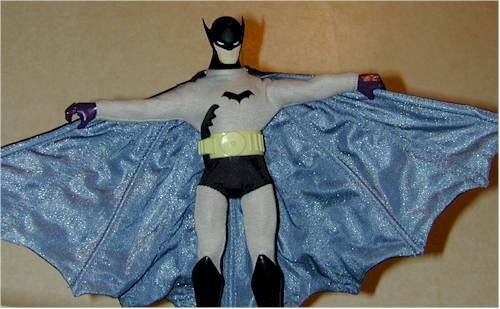 My only complaint is that the bat symbol, while the right size and shape, is very off center on my figure. 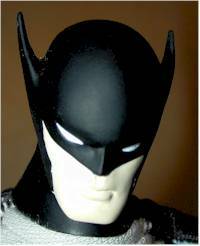 The only real accessory here is the batarang, nicely sculpted. It fits in the large utility belt, and is a welcome addition since most of the other DC 9" figures have been painfully lacking in any sort of accessories. This is easily the best DC 9" figure so far. While some folks will tell you that isn't hard, I've always liked this line. But even I have to admit that this is quite an improvement. However, I still had my problems with it - as I said, the symbol on mine is not centered correctly, and this is an awfully expensive figure for what you get. If the figure had been $15-$20 for just it, I could handle that. The reprint comic and partial Daniels book are certainly not worth boosting the price to $45, and I certainly hope that we don't only get this level of quality and style on this type of inflated figure. C'mon Hasbro, give us this quality on a $15 figure!